Among the special Purims celebrated by some Jewish communities on certain days of the year to commemorate a particular miracle, there is also a Purim which the Sephardic Jews of Hebron used to celebrate on the fourteenth day of Tevet. The historical details of this happening are hidden in the mists of the remote past. Our story is based on that event. Many, many years ago, the old city of Hebron was inhabited by a community of Sephardic Jews who had been driven out of Spain and other Christian lands where Jews were cruelly oppressed. One day two venerable Jews arrived in Hebron from Jerusalem, for the purpose of collecting money for pidyon shvuyim (obtaining the release of Jews from slave-traders). The two emissaries met with the heads of the community and explained their important mission: to collect not less than five thousand piasters from the Hebron community for their lifesaving endeavor. The heads of the community knew that, with a vigorous effort, they could manage to raise the required sum, but they claimed that “charity begins at home,” and they had to meet the needs of their own poor people first. So they “bargained” with the emissaries, who insisted, however, that nothing less than the five thousand piasters would be acceptable. And if the Hebron community refused, or were unable to raise the required sum, the Almighty would show them where the necessary help would be available, and the Hebron Jews would lose the great merit of pidyon shvuyim, saving Jewish souls. The arguments and entreaties of the emissaries proved in vain, and they left empty­handed. Now a new pasha came into power as ruler over Hebron, and he was a Jew-hater. He lost no time in introducing new edicts against the Jewish community, draining them of their hard-earned money. At first he began in a moderate manner, but very soon tired of this slow process, and looked for some way in which he could make a clean sweep and cash in all that the Jews possessed. The pasha was an educated man, who mastered several languages in addition to Arabic, which was his native tongue. He read in history books accounts of how Christian rulers treated the Jews in their lands, and learned that, in some cases, they threw rabbis and Jewish leaders into prison until such time as their Jewish communities would ransom them for huge sums of money. Some Christian rulers, he found, even went to the extent of driving the Jews out of their country, robbing them of all their possessions. This latter possibility appealed greatly to this Jew-hating pasha. He quickly issued a call to the rabbis and leaders of the Hebron Jewish community, and told them that he had put a tax on them, in the sum of fifty thousand piasters, which must be paid within the month. Failing which the Jewish leaders would have to pay with their lives, and the rest of the Jews would be sold as slaves! And, to make sure that the leaders would not run away, a few of them were immediately arrested and put in chains. The pasha then sent the others home, warning them that they had better start at once to raise the demanded fifty thousand piasters. The entreaties of the rabbis and leaders that it was impossible for them, and in so short a time, to produce such a vast sum, fell on the deaf ears and stony heart of the cruel pasha, and they left in great despair. The heads of the Jewish community now realized that they were being punished by G‑d for having refused to find the five thousand piasters asked of them by the emissaries from Jerusalem, to save Jews from being sold as slaves. And now they were being taxed tenfold by the cruel pasha. The rabbis immediately decreed that the Jewish community must fast and pray to the Almighty for salvation from their desperate situation. 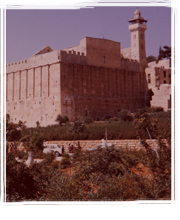 At the same time they decided to send a pidyon (literally, “ransom,” but in this case, an appeal) to the Patriarchs Abraham, Isaac and Jacob, who were buried in the Cave of Machpelah which is situated in Hebron, to pray to the Almighty on their behalf and intercede for their children in their desperate hour of need. The rabbis first went to the mikvah, and having purified and sanctified themselves, they wrote out their appeal to the Patriarchs on clean parchment, the same as is used for the holy Torah scrolls. The problem, then, was the matter of the delivery of their appeal. How could it reach the holy Patriarchs? The Cave of Machpelah was then in Arab hands. The Muslims had built a house of worship above the cave, and Jews were not allowed to visit the holy graves. The Jews were allowed only to ascend a few steps of the building and pray at the site of their holy ancestors from a distance. And even for this “privilege” they had to pay the guard. The only way they could think of was to bribe the guard that he should throw the pidyon into the cave, the entrance of which was sealed, so that even he could not enter it. This, they knew. But they also knew that there was a kind of “window” there, through which it would be possible to throw in the pidyon. For a sizeable bribe the guard agreed to do them this “favor,” and swore “by the beard of his prophet” that he would attend to the matter without delay. The night before the due date for payment, the pasha could not sleep; his mind was full of the thought of all the money he would be getting from the Jews. The moon was full, and the following day he hoped his coffers would be equally full. The money-greedy pasha kept his treasures in an iron safe in his bedroom. Whenever he had a sleepless night, he would open this safe and take out a bag of gold coins and count them with great satisfaction. This night, too, being unable to fall asleep, he went to his iron safe and took out a large bag of money and began to count the glittering, golden coins. It totaled fifty thousand piasters exactly, and he gleefully thought that the next day he would be receiving exactly the same amount from the Jewish community. With a happy smile he returned the bag to the safe, put the key of the safe under his pillow, and fell blissfully asleep. Suddenly, he was startled to see three old men in his room. “Give us the bag with the fifty thousand piasters, if you value your life,” they demanded. In fear and trembling, he got the bag of money and handed it over to them. And, as suddenly as they appeared, they vanished as if into thin air. The pasha awoke in a cold sweat. What a terrible nightmare! He at once put his hand under his pillow, and was reassured to find the key just where be had left it. So, with a sigh of relief, he went back to sleep. The following morning the pasha awoke, and completely forgot about his nightmare of the previous night. He did not forget, however, that this was the day when he would be receiving the fifty thousand piasters from the Hebron Jews. The previous night had also been a sleepless night for all the Jews of Hebron. They had assembled in the beit hamidrash. They prayed with all their hearts that G‑d would save them, as the “hour of reckoning” had come. As the shammash walked with faltering steps towards the door and was about to open it, he gazed with unbelieving eyes at a strange bag which lay in the basin in which the congregants washed their hands on entering the beit hamidrash. He could hardly lift the heavy bag, which he quickly handed to the head of the community. With unbelieving eyes they saw its precious contents. The shammash rushed back to open the door for the pasha and his soldiers. “I have come for the fifty thousand piasters which are due today,” the pasha demanded. “Here is your money,” said the president of the community, handing over the bag to the pasha. The pasha looked at the bag of money and could hardly believe the evidence of his eyes. So, as this particular miracle took place on the fourteenth day of Tevet, when the Jews of Hebron were saved from a dreadful catastrophe, they took upon themselves to celebrate every fourteenth day of Teveth as their Purim, which came to be known as “Window Purim” in remembrance of the “window” in the Cave of Machpelah which had brought them the miraculous salvation. Blessed experience My husband, of blessed memory and I went to Machpelah, it was a most extraordinary experience. As we walked up the steps and ramp, there were Arab soldiers with rifles looking angrily at us. to return Oh to return ti the time of the Patriarchs!! The tomb of the Patriachs should be taken from dir It really saddens me to hear of holy places where non-believers posses them. Fact, fictionalization, and A.H.N. That oppression did occur is a historical fact. The details of how it happened in this particular incident, and especially whether the motivation was hatred (desire to harm) or greed (desire for the money) are not. Details of this particular incident, not oppression in general, is unproven. The only problem I see with what AHN wrote is the claim that the article "present[s] Christians as Jew-haters". The story appears to take place after the expulsion from Spain (1492) and before the British took control (less than 100 years ago), and Hebron was not under Christian rule during that time period (the British were the only Christian to rule Hebron after the expulsion from Spain, and there were no British Pashas). The Moon Turns a Fiery Red Like John in MD I noted the coincidence of lunar eclipse on the winer solstice and looked to see what if any Jewish events may have occurred on the Hebrew day. I believe (not certain) that lunar eclipses occur only when the moon is full. Thus only the nights of and after the 14th of the Hebrew month are potential eclipse nights. There is not one but three coincident events. One: the winter solstice, which occurs without any reference to the lunar cycle. So, that the Winter solstice occurs on a day on which a full moon is seen is a coincidence. That is rare enough. Indeed I couldn't agree with you more. Antisemitism in all its forms must rank as one of the greatest distortions of history, a pitfall that has no place in this world or the world to come. "The historic details of this happening are hidden in the mists of the remote past."